9 April 1917: Vimy Ridge and Captain Daniel Gordon Campbell, one hundred years ago today. Then we came to open country and the road wound upwards. Stretches of barbed wire, gashes in the ground, trails of camouflage, sandbags in heaps, told us where we were. But they were far less noticeable than they had been from the railway. Our eyes commanded a wide stretch of country, sweeping away to the horizon. For miles all around the air was pure and sweet, and the horror of Thiepval seemed far behind. We saw nobody at all and it was hard to realise that so short ago this had been a battlefield for thousands. Only a lonely cross here and there – or a group of crosses – suggested it. I had begun to fear our American had forgotten all about us and was prepared to carry us to the end of the world when all at once, in the centre of the champaign and at its crest, he stopped. ‘This is [Vimy] Ridge,’ he said, ‘I’m going on to Lens. Goodbye.’ Hardly waiting for our thanks, he whizzed off and we were alone. The high ground of Vimy Ridge provided a natural vantage point of great military significance. In April 1917, as part of the wider Battle of Arras, the Canadian Corps succeeded in winning the Ridge from the Germans at the cost of over 10,000 casualties. The silence was unbroken; the land was desolate. Almost afraid to break the quiet, we moved on to the grass, and with a cry of delight, I stooped down and picked a flower. It was the commonest little yellow thing, that grows in unnoticed thousands at home, but I held it reverently and greedily and the Hut Lady looked at it too. ‘Isn’t it lovely?’ she said lingeringly, stroking it petal by petal. To find a flower after all that we had seen, seemed a miracle. We moved on and picked up bits of shells, bullets, stray bits of camouflage: all the odds and ends left over from the fighting. My eyes had turned to the horizon again, to the heights that once were St Eloi. Someone I knew lay there, who had been a Canadian, and it was too far for me to go. I could only see the Ridge where he had been killed, and not the place where he lay. As Christina looks towards St Eloi, we have a rare insight into her personal experience of loss and grief during the war years. The soldier in her thoughts is Captain Daniel Gordon Campbell of the Canadian Infantry, who had been engaged to marry her sister Louise. He had grown up near the Keith family, in Halkirk. Like them he attended the Miller Institute and Edinburgh University, where he excelled both academically and at sport, representing Scotland at the high jump. A lawyer, he had emigrated to Canada, and was serving with a Canadian regiment when he was killed at Vimy Ridge on 9 April 1917. He is buried in the cemetery at Mont St Eloi. Louise was devastated by his death, and kept detailed scrapbooks which include newspaper cuttings about the Canadian action at Vimy, letters of sympathy from friends, and information about his final resting place. The great high cross, with Canada in white letters, stood high on the crest of the ridge. The bright March sunlight danced on the white letters and picked out with silver the grey cross. The keen March wind blew like the winds of home over all the quiet field. The Hut Lady and I sat in the shadow of the memorial and looked towards St Eloi. I have never seen the snapshots for, though our officer carefully took our names and addresses down on our map, he forgot to send them. Today Vimy Ridge is the site of the breathtaking Canadian National War Memorial, overlooking the landscape on which so many Canadians lost their lives. More than 11,000 names of those whose grave is unknown are inscribed on the walls of this impressive monument, which was unveiled in 1936. However, even while the war was still continuing, memorials were erected on Vimy Ridge to commemorate the devastating losses suffered by the Canadian troops. Christina and her friend were photographed at the foot of one of these memorials. Louise’s scrapbook contains a photograph sent to her of one such cross, which may be the one visited by Christina. Daniel Gordon Campbell is among the lawyers featured in this exhibition in Toronto. It’s good that he is remembered. This entry was posted in First World War, Keiths, Research, Writing and tagged Canada, Christina Keith, Daniel Gordon Campbell, First World War, Louise Keith, Vimy Ridge, War Classics on April 9, 2017 by florajohnston. I was interested to come across the Reflections of Newcastle project, which seeks ‘to explore the intellectual, cultural and social life of Newcastle during the First World War, concentrating in and around the Lit & Phil.’ It has a lot of resonance with my researches into Christina Keith’s life immediately before she set off for France. I visited the Lit & Phil building in Newcastle as part of my research for War Classics: the remarkable memoir of Scottish scholar Christina Keith on the Western Front. Christina’s first job was as Classics lecturer at Armstrong College, Newcastle, but as soon as she took up the post in 1914, war was declared. The College was requisitioned for use as a military hospital and the department decamped to the Lit & Phil building. Christina lived and worked in Newcastle all through the war years until 1918, when she set off for France to take part in the army’s education scheme under the direction of Sir Henry Hadow, who had been Principal of Armstrong College. There’s more information about Reflections of Newcastle 1914-18 here. This entry was posted in Education, First World War, Keiths, Research, Women and tagged Armstrong College, Christina Keith, Classics, education, First World War, Newcastle on June 29, 2016 by florajohnston. Christina Keith, whose extraordinary wartime story you can read in War Classics, was the eldest of eight children. The Keith family, like so many others, saw one child after another drawn into a different aspect of the First World War. One of her brothers, William Bruce Keith, joined the Navy and was involved in the Battle of Jutland, the centenary of which is being remembered today. William as a boy, appropriately dressed in a sailor suit. William wanted to go into the Navy and he discovered that he had just missed the date by which he had to apply and he would have to do something else, and then the war broke out so he was able to get in after all. The Navy at Scapa Flow was a very real presence in the lives of the Keith family living in Thurso, and in her memoir Christina often refers to the familiar sight of battleships in the Pentland Firth. In 1916 William, now aged 18, was a midshipman on HMS Warspite. He describes the whole engagement in vivid detail in a letter to his brother Barrogill, who was serving with the army in France. Our steering gear now got jammed and we started turning in circles – just before the ‘Defence’, which was quite close to us, caught fire and vanished. We were now helpless and the Germans seeing us turning in circles singled us out and concentrated on us. We had about 6 or 7 firing at us, and we couldn’t reply as we were turning so quickly that the guns wouldn’t train fast enough. Shells were bursting all around us, and I thought it was all up. One shell dropped so close that the spray from it drenched us in the foretop. We were hit several times and one small splinter came into the foretop. He was able to take some leave at home in Thurso, just across the water from the naval base at Scapa Flow on Orkney. 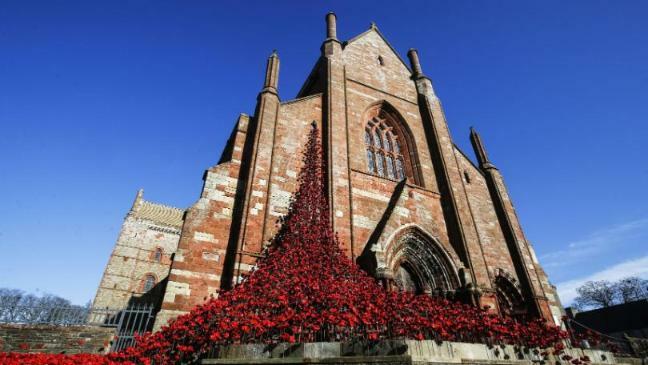 Today, one hundred years on, a service was held in beautiful St Magnus Cathedral to commemorate the 8500 men, both British and German, who lost their lives in the Battle of Jutland. This entry was posted in First World War, History, Keiths and tagged Barrogill Keith, Christina Keith, First World War, History Press, Thurso, World War I on May 31, 2016 by florajohnston. This entry was posted in First World War, History, Research and tagged armistice, Barrogill Keith, Christina Keith, First World War, Mildred Keith, peace, remembrance on November 10, 2015 by florajohnston.